This is the publicaiton of my thesis project. The tray was custom-made for the three jars that contain the typography book, the color book, and the imagery book. I want to give a naturalistic and organic feel to it by using paper thread, glass jar, and wooden tray. The elements I used on the publications are elements that we can easily find on organic food packaging. People might buy a product simply because it comes with an eye-catching packaging. Package design is one of the most important marketing strategies to a brand, especially in the organic food industry. Consumers look for eco-friendly and “green” options for their food. The organic food industry is rising tremendously and packaging is becoming more significant because consumers are concerned about environmental issues. I will examine the graphic design vocabularies for organic food packaging, and how their concepts are being communicated to the public, in terms of materials, typography, imageries, and colors. 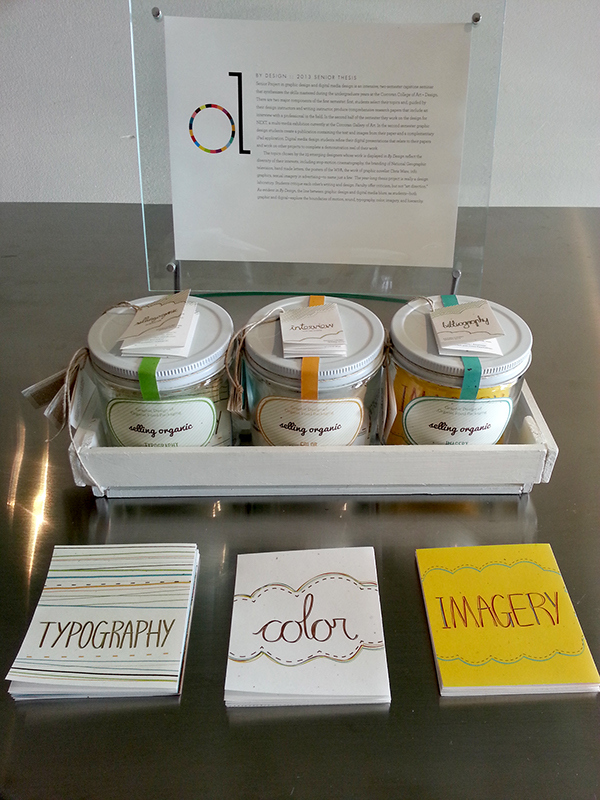 The tray was custom-made for the three jars that contain the typography book, the color book, and the imagery book. I want to give a naturalistic and organic feel to it by using paper thread, glass jar, and wooden tray. The elements I used on the publications are elements that we can easily find on organic food packaging.